The institute is designed for academic leaders, including provosts, vice presidents, deans, department chairs, academic governance officers, interested faculty, accreditation team members, institutional planners, and institutional effectiveness professionals. Begins with the basics involved in developing or enhancing a program or schools strategic position in the global learning marketplace.Participants will assess their institutional structures against the characteristics of the emerging global digital learning ecosystem and the transformations a number of schools, colleges and programs are already doing to serve contemporary learners. Next the curriculum turns to the basics of curriculum architecture and assesses the strengths, weaknesses, opportunities and threats emanating from the degree of alignment between architecture, program design, course options, assessment strategies, and curriculum-learner optimization pathways. 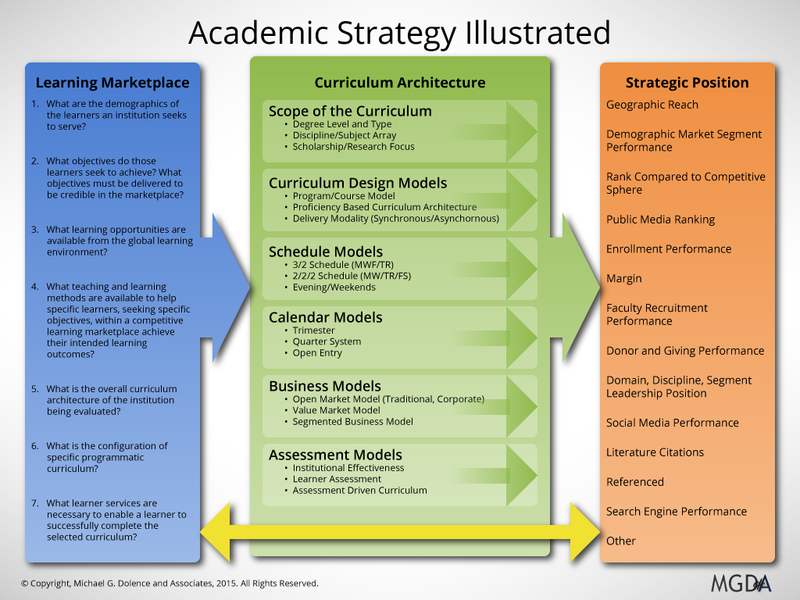 Particular attention is paid to creating strategic advantage through curriculum architecture revitalization. Examines the principles of sustainability and applies them to various curricular scenarios. Focuses on innovating from where you are with what you have. Emphasis is identifying opportunities and focused implementation. Examines basic principles of prototyping curricular changes and modeling programs of study. effective academic management and the fit and friction points encountered in academic collaboration, strategy development and implementation. Developing synergy between academic missions, visions, perspectives, calendars and workflow cycles. Examines the basic interface between academic schools, colleges, departments and programs and the SEM (Strategic Enrollment Management) enterprise of the institution. Explores specific program level marketing and positioning approaches and the strategies that drive them. Examines the principles of integrating revitalized academic schools, colleges, and programs with the Master Academic Plan. Discusses the influence and potential revitalization has upon the institutional planning system and various plans. (e.g. Institutional Strategic Plan, Strategic Enrollment Management Plan, Campus Master Plan, Fiscal Plan, Human Resources Plan…).